Cashback Reward : Earn up to 94$! TransStart® Green qPCR SuperMix UDG is a ready-to-use qPCR cocktail containing a novel TransStart® Taq DNA Polymerase, optimized double cation buffer, SYBR Green I fluorescence dye, dATP, dUTP,dCTP, dGTP, PCR Enhancer, PCR stabilizer and UDG (Uracil-DNA Glycosylase). qPCR SuperMix is provided at 2x concentration and can be used at 1x concentration by adding template,primer, passive reference dye (optional) and H2O. 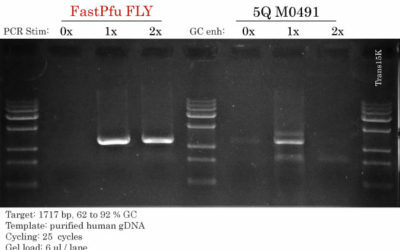 TransStart® Taq DNA Polymerase, a novel “hot start” enzyme with double blocking technique, provides high sensitivity, high specificity and accurate data. 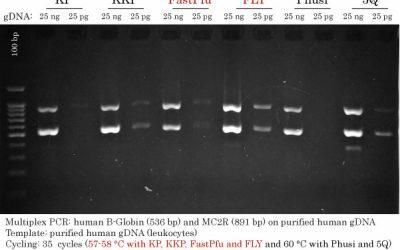 Double cation (K+, NH4+) buffer enhances the specificity and reduces primer-dimer formation. Passive reference dyes are suitable for different qPCR instruments (normalize the fluorescent signal between reactions).